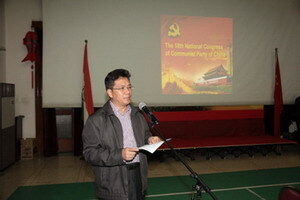 On November 20, 2012, Chinese Embassy in India held a press briefing on the recently concluded 18th National Congress of the Communist Party of China (CPC). 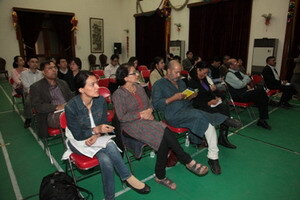 Journalists from more than 20 Indian and Chinese media organizations attended the event. Mr. Deng Xijun, Chargé d' Affaires of the Chinese Embassy in India, presided over the briefing and delivered a keynote address. 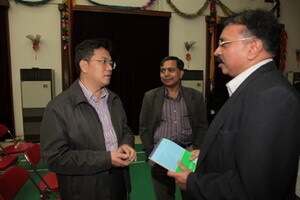 Mr. Wang Xuefeng, Minister of the Embassy and some other Chinese diplomats were also present. Mr. Deng Xijun introduced the theme and key points of the 18th Party Congress, development goals and outlines of China in the future, Chinese foreign policy and China-India relations. He said that the 18th National Congress of the CPC was of great importance because it was held when China had entered the decisive stage of completing the building of a moderately prosperous society in all respects and accelerating the transforming process of the model of its economic development. It had introduced an overall development plan including economic, political, cultural, social and ecological progress. New leadership of the CPC was elected and amendments were made to the Party Constitution as well. On China's foreign policy and the policy towards India, Mr. Deng stressed that China would unswervingly follow the path of peaceful development and firmly pursue an independent foreign policy of peace. China would continue to promote friendship and partnership with its neighbors and ensure that China's development would bring more benefits to them. To China, India is not only an important neighbor but also an indispensable partner in international affairs. It is China's national policy to maintain and further promote the Strategic and Cooperative Partnership with India. China and India, as the two big emerging powers in the world, have their respective strong points on their way of development. There are a lot of areas they can cooperate in and a lot of things to learn from each other. China's development is an opportunity to India and vise versa. So, the two countries should work together for the benefit of their countries and peoples as well as the peace and prosperity of the region and the world. Further more, detailed information about achievements in the past 10 years, the election procedure of congress delegates, composition of delegates, members of the new leadership, etc. was shown in multi-media ways which was greatly appreciated by the journalists. 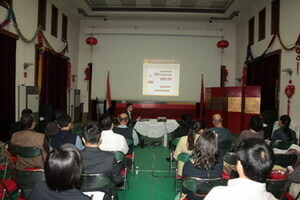 The Chinese diplomats and the journalists exchanged views with each other after the briefing.